Bicycles are considered to be vehicles, under California law. This means that bicyclists are afforded all of the rights that drivers of motor vehicles enjoy. Unfortunately, the relationship between car drivers and bicycle riders is one fraught with tension: many motor vehicle drivers fail to take proper care around bicycles or choose to ignore bike riders’ rights, while bicycle riders often violate the law by not stopping at traffic lights and signs, or by riding against traffic. The inevitable result of this situation is that accidents involving bicycles are very common in California. Of the 726 cyclists killed in traffic accidents in the United States in 2012, 124 of them were riding on California roads. California’s number of bicycle deaths per capita is 40% higher than the national average. And many more California bicyclists—more than 10,000—are seriously injured in road accidents every year. For nearly 20 years, Ashton & Price has worked to protect the rights of the many bicyclists in Sacramento, and throughout Northern California. We have a special dedication to serving the bicyclist community. In fact, one of the founding members of our firm, Attorney Craig Ashton, has been an avid road biker for many years (and in fact has completed four full Ironman triathlons, which include a 112 mile bike ride). If you or a member of your family has been injured or killed in a bicycle accident, you are entitled to full and fair compensation from the auto driver’s car insurance company. Even if you believe the accident was not entirely the driver’s fault, you may still be entitled to partial damages for the injuries and losses you’ve suffered. We have an in-depth understanding of California’s laws as they apply to bicyclists, and we have a wealth of experience in investigating bicycle accidents and bringing them to trial. Contact us for a free consultation. We believe that you deserve to be treated with respect and care, and will give you an honest assessment of your chances of recovering financial damages through a settlement or trial. It’s critical that you seek out appropriate medical care in the aftermath of a bike accident. Our first priority is for your physical well-being. Even if you don’t have medical insurance, we will put you in contact with some of the best medical care providers in Northern California, who will immediately evaluate you and tend to your injuries. In the majority of cases, you will owe no out-of-pocket expenses, as the providers will treat you on a lien basis. We are here to help you: that’s our job. Before you leave the scene, get the contact info of the at-fault driver, as well as any passersby who were in the area at the time of the accident. Use your phone to take pictures of the scene, including your injuries, your bike, and the car that hit you. Call the police, or ask someone at the scene to call the police on your behalf, to ensure that an official accident report is filed. Don’t talk to the insurance company representing the at-fault driver. Talk to a lawyer first: they’ll either tell you what you should say, or they’ll speak directly to the insurance company for you. California is a comparative negligence state, which means that anything you say about the accident that can potentially undermine your case can be used against you to hurt your legal claims. Keep track of the costs associated with repairing or replacing your bicycle. Motor vehicle drivers have a legal responsibility to use reasonable care when driving on our state’s roadways. Drivers are expected to slow down in residential areas, as well as near schools and on streets with bike lanes. Part of this expectation is due to the fact that children are often present in some areas, and often don’t have the same level of caution that adults would have. The law considers vehicle drivers to have a special responsibility to take extreme care around children. At the same time, while the law takes special care to protect children riding in areas where it’s reasonable to expect children to be present, it is possible for even children to lose the benefit of these special protections. If a child rides out into the street and is hit by a car in an area or in a manner wherein a driver had no reason to believe that a child might unexpectedly appear in the roadway, it can be extremely difficult or impossible to hold the driver liable for damages. Sometimes the law holds both the driver and the child comparatively responsible, or negligent, depending on the facts of the accident. Ride in the same direction as the flow of traffic on your side of the road. Many believe that it makes sense to ride so that you are facing traffic, and can see cars as they approach you. This isn’t true. Following the flow of traffic reduces the collision speed in the case of an accident, lessening the potential for serious injury or death. 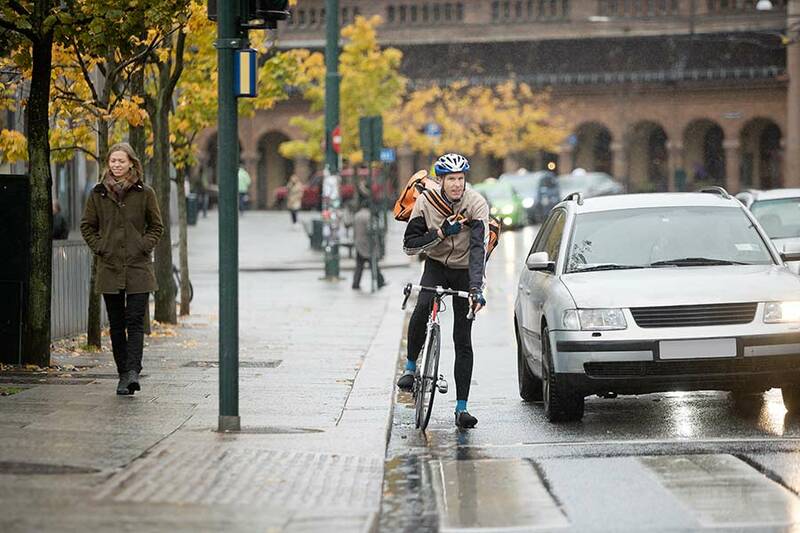 Additionally, drivers who are preparing to turn can more easily see bicycles riding alongside them, as opposed to a bicyclist who suddenly appears out of nowhere from the opposite direction. Lastly, riding with the flow of traffic allows you to see the same road signs that drivers do, giving you important information about approaching road conditions. Obey traffic laws. Bicycles are vehicles. As such, as they are required to obey all the same traffic laws that motor vehicles do. This means that bicycle riders must obey all street signs and signals. Yield to oncoming traffic. If a car in your place is supposed to yield to oncoming traffic, then you must do the same on your bicycle. Failing to do so is not only against the law, but may also result in serious injury or loss of life. What would be a minor accident between two motor vehicles can easily kill a bicyclist. Additionally, yield to all pedestrians in a crosswalk. Many bicyclists have been held criminally and financially responsible for causing serious injury to foot pedestrians. Always be alert. You need to always pay attention to everything that is going on around you. Watch out for road conditions such as cracks, potholes, leaves, and other obstacles that could cause you to lose control. Also be aware of all cars and pedestrians around you. Avoid wearing headphones, so that you can hear sounds that may signal immediate danger, such as screeching tires or yelling pedestrians. Look both ways. Just as your parents told you before crossing the street, always look both ways and use appropriate signals before turning. Bicyclists can signal turns by either learning and using hand signals, or by purchasing and installing light signal systems manufactured for use on bicycles. If you choose to use hand signals, remember that you only use your left arm for signaling left and right turns: fully extending your left arm straight out signals a left turn, while holding your left hand up with a 90 degree bend at the elbow signals a right turn. Bicyclists are entitled to the same protections and financial compensation in road accidents that are afforded to auto drivers, motorcyclists, and pedestrians on-foot: financial damages for past and future medical care, past and future wage loss and pain and suffering, and so on. However, this requires the bicyclist to be able to demonstrate that the other party was at fault. Unfortunately, bicyclists are often at a significant disadvantage when it comes to recalling the facts leading up to an accident, for a simple reason: bicyclists are much more likely than car drivers to suffer extreme physical and emotional injury that makes it difficult to accurately recall what happened. Meanwhile, the responsible driver may choose to protect his or her own interests by describing the accident in a way that absolves them of any responsibility, avoiding financial liability and criminal prosecution. As a result, many injured bike riders need the services of an expert who can use scientific observations and measurements to construct an accurate account of how an accident actually occurred. One such expert is Alex LaRiviere, a self-taught “bike nut” who has built a nationwide reputation for reconstructing bicycle accidents. By carefully analyzing the scene, as well as the various bits of damage left on a bike frame after an accident, LaRiviere can reconstruct what led up to an accident, including driver error, mistakes on the part of the bicycle rider, and even manufacturing defects in the bicycle itself. In 30 years, Alex LaRiviere has consulted on more than 700 legal cases involving bicycle accidents, and has testified as an expert witness in a number of personal injury, wrongful death, and product liability cases. Having the services of an expert like Alex LaRiviere is incredibly important to personal injury attorneys, such as those at Ashton & Price, who can draw on the expert’s knowledge and experience to explain in detail the timeline of events that led up to a serious bicycle accident. If you have been injured in a bike accident, securing the services of an experienced personal injury attorney—such as one of those at Ashton & Price—allows you to also draw on the wisdom of accident experts whose service you would otherwise be unable to obtain.